Have I told you lately how much I love cookie bars? Cookie bars make my life easier. They make it so I don’t have to get a cookie scoop or an extra tablespoon dirty. I don’t have to shape anything. I don’t have to roll anything. I place the dough or batter in whatever form, in to a pan. And then I bake. It’s that simple. Can I tell you about something else that is also amazing and makes my life easier? Prepared Cookie Dough. Gluten Free Pillsbury Cookie Dough. It comes in a tub. Whoa! It’s also amazingly delicious. Everyone who tastes the cookies that come out of this prepared cookie dough can’t believe that it’s gluten free. Pillsbury has also released a few other gluten free options. I can’t wait to try them all. I know that I just shared some gluten free cookie bars with you made with this same dough. I had to use the dough again though. I needed to see what else could be done with it. I decided to make another layered cookie bar. I had some sweetened condensed milk in my pantry and I’ve been meaning to make some fudge with it for a while now. I decided to make some mocha fudge to layer on to the chocolate chip cookie layer. I’ve been told that it’s super easy to make fudge using a can of the sweetened condensed milk. And it is easy. And it comes out amazing. I preheated the oven to 350. Then, I pressed the cookie dough in to a sprayed 9×13 glass baking dish. I baked the cookie dough layer in the oven for about 11 minutes, until I saw it begin to brown. While the cookie layer baked, I made the fudge layer. 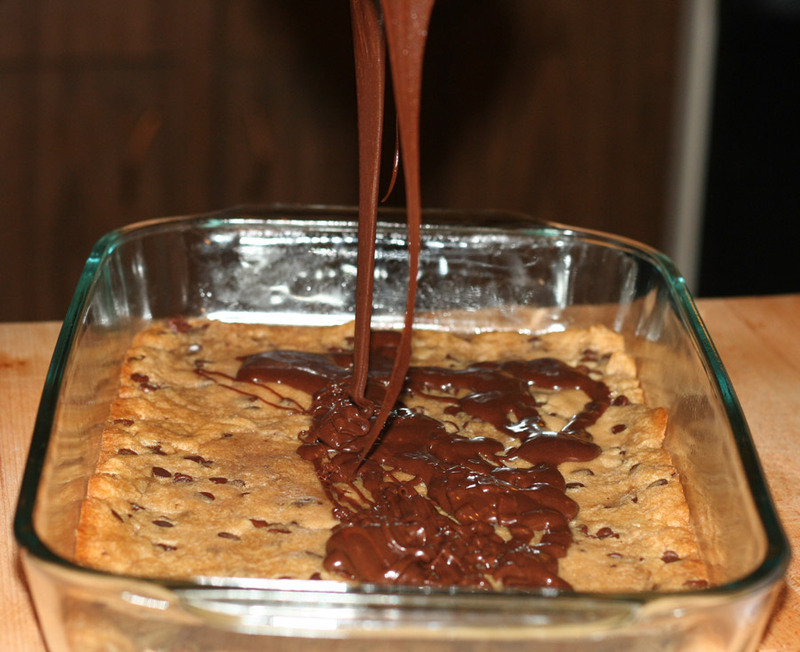 I heated up the sweetened condensed milk in a heavy pan and mixed it with some chocolate chips. I let everything melt and and incorporate in to each other. I mixed in some instant espresso powder. Once that mixture was ready, I poured it over the baked chocolate chip cookie layer. Holy deliciousness! 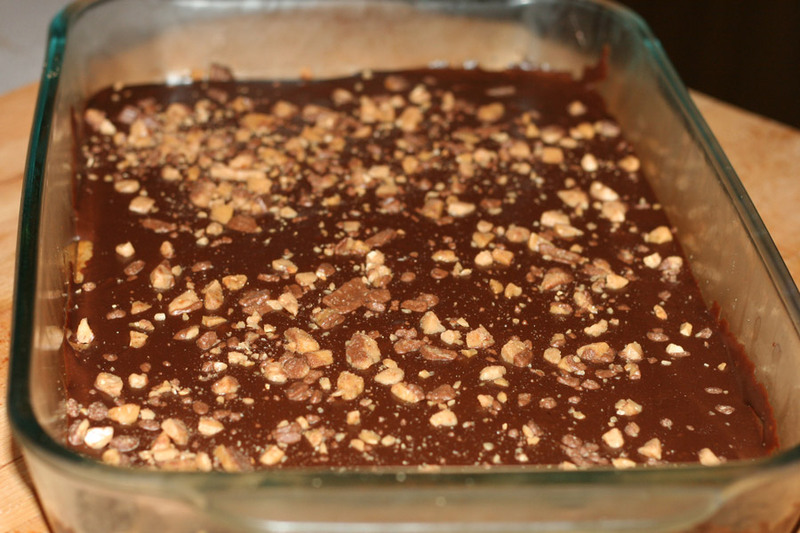 I smoothed the fudge layer and sprinkled over some toffee pieces. I made sure the pan was cool and then I placed it in the fridge to cool and set for a few hours. Then I dug in. Amazing! So rich and decadent. And super easy to make. 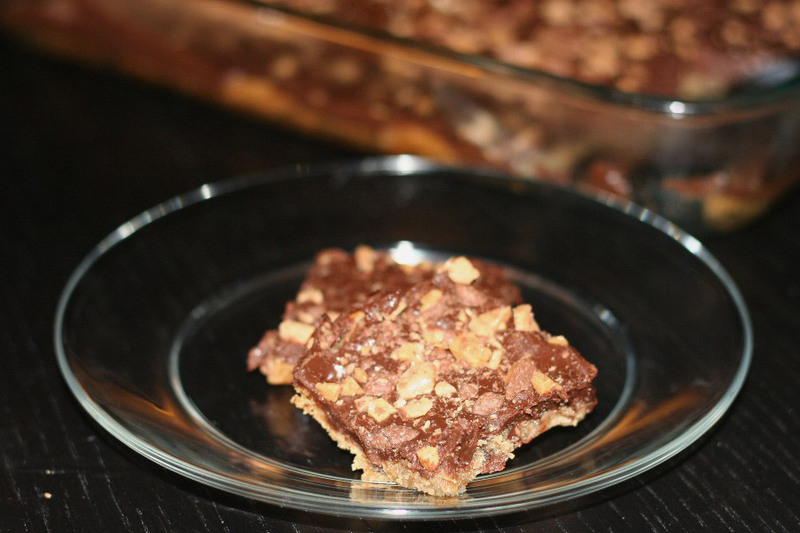 Definitely put this on your next gluten free dessert list! **This post was sponsored by Pillsbury. The recipe and content are my own. 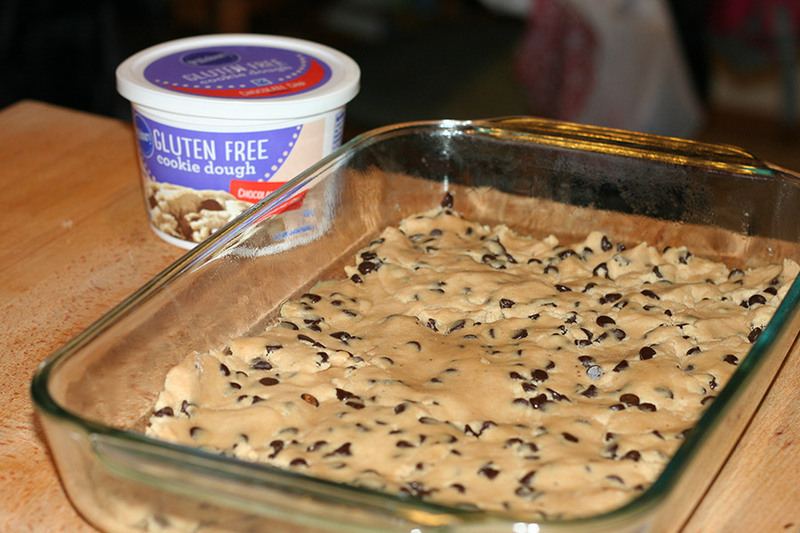 Press the cookie dough in to a sprayed 9×13 baking dish. Bake the cookie dough in the oven for about 11 minutes. While cookie layer bakes, prepare the fudge layer. In a heavy bottomed saucepan, mix the sweetened condensed milk with the chocolate chips and instant espresso powder. Cook over low heat until everything is melted and mixed together. Pour mocha mixture over the baked cookie dough. Place cookie bars in refrigerator to cool and set. Should take 2-3 hours. I rarely succumb to impulse buys. Especially when the ads show up in my inbox. I will blame the heat. These 90+ degree days are doing something funky to me. I keep getting emails advertising a variety of popsicle makers and popsicle stores. There’s even a popsicle food-truck! I haven’t been in to popsicles since I was pregnant with my older daughter. Popsicles were my crack. I am not a fan of most store-bought popsicles. I like the occasional Fudgsicle or pudding pop. Do pudding pops still exist even? Trader Joes and Whole Foods make some pretty tasty fruit juice popsicles. When I am there though, it’s just not something I reach for. When my sisters and I were kids, we used to pour juice into dixie cups and then stash them in the freezer. Only to have my mom open the freezer to half-frozen cups of juice pouring on to her. My parents stopped buying dixie cups at some point. They did buy popsicles. They weren’t evil. They just didn’t like the sticky mess all over the freezer. I get it now. Anyhow, those emails worked. Good marketing, Amazon! Good marketing, Williams Sonoma! You got me on an online popsicle search. They have these handy dandy electric popsicle makers now! I’ll admit, that appliance was tempting. I don’t need my popsicles to be ready in 5 minutes, though. I also don’t really need another big appliance. I want more than 3 popsicles at a time. The old-school plastic popsicle molds are great, but you end up losing the pieces. I decided to buy this one. I like the familiar shape of the popsicle and I like to use the traditional wooden sticks. It’s very easy to use. Highly recommended. It also showed up in my inbox, on sale, on a 100 degree day. Once again – good job, Amazon! It showed up in my house 2 days later and I had to make something. I knew that coffee had to be the star of my first shot at popsicle making. We had just cleaned our pantry and noticed three cans of sweetened condensed milk. 3 cans? I never use that stuff? Good thing those cans have a long shelf life. When I was in college and high school, I used to spend the majority of my time (when not in class or work) at a local coffee shop. Cafe Wyrd was the best coffee shop around. I used to sit with my school books, a pack of American Spirits, and a big pot of coffee. Being that I was a regular there, the baristas used to push special drinks on me every so often. They introduced me to Vietnamese Iced Coffee. I could get hooked on that drink. If it weren’t for the fact that I was a poor college student at the time – I probably would have been hooked. I am not usually a fan of sweet coffee, but that stuff was good and it stuck with me, in the back of my coffee addicted mind. It’s so easy to make. A good espresso and some sweetened condensed milk over some ice. It’s perfect popsicle fodder! I didn’t even need a real recipe! I brewed up some super strong espresso. About 2 cups. I let it cool for a bit. I poured the sweetened condensed milk into a small mixing bowl. About 3/4 of that small can. Add in the cooled off espresso. Mixed it all up. Let the mixture chill in the fridge for about a half hour. The poured everything in to the molds. Put the mold in the freezer for an hour. Stuck the sticks in when partially frozen. Let freeze overnight. This made for amazing popsicles! What’s my next popsicle flavor?